“I am having a hard time reading my Bible and praying.” These are the words I have heard so often from numerous different people. We have heard that a growing relationship with God and living in the power of His Spirit is developed through these disciplines, but so often it is hard to put them into practice. As I have grown over the past decades, I have come to define the process of developing my friendship with God as taking a walk. Great Grandma Thomson was a walker. She did not have a driver’s license, so she spent many hours and miles walking to places she wanted to go. I remember numerous times walking with her when I was younger. Sometimes we would leave her house in Northern New Jersey, walk up the Belleville Turnpike to Kearny Avenue and continue on this main street until we would reach Green’s Market. While there we would pick out the things she needed for that night’s dinner and carry them back down the avenue and pike to her kitchen where she would set about to prepare a nutritious meal. This was a regular occurrence for her as she could only carry a little at a time. It was necessary for her to discipline herself daily to walk to the market to gather what she needed for each day. When we were together we would talk about many different things and she would share stories about her childhood and life. It was a very pleasant time for both of us. I consider reading the Bible and praying as taking a daily walk with Him. It is a discipline that is important to develop and maintain if you want the friendship to grow and if you want to gain the “spiritual nutrition” that gives you strength for the long journey of your life. If Great Grandma had considered all the miles she walked in a lifetime it may have felt overwhelming, but she didn’t. She just thought about what she had to do for that particular day and she did it. Looking back the distance she had come was huge, but she accomplished it one step at a time. If you are having a hard time applying the disciplines of Bible reading and prayer, don’t compare yourself to anyone else. Just start by setting aside ten minutes each day to take a walk with God. Read a few verses, pray about them, and listen for God to speak. You may even like to write some of your thoughts in a journal. As time goes by your walks will get longer and your friendship will grow stronger. Great Grandma lived a long and vibrant life. I believe it had something to do with the fact that she was a walker. Her daily ritual kept her body strong and healthy. 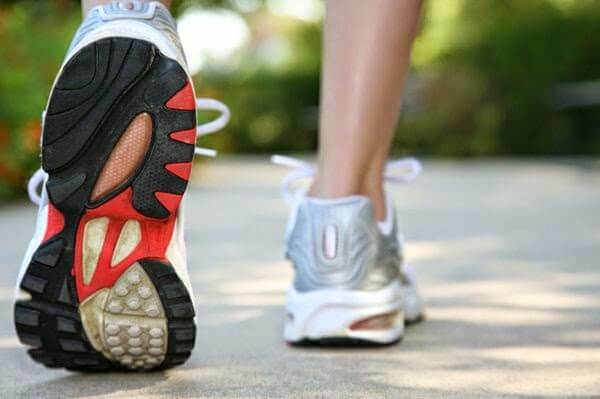 If you want to have a healthy spiritual life, put on your walking shoes and take the first step. Living with God’s Spirit means walking with Him every day.